Part 2 of this Trash to Treasure Transformation guest series is from Sara of one of my new favorite blogs, House Bella. She and her husband have a clean and inviting style that draws you in and makes you want to stay awhile. Visit her blog to see how she is pulling her home together so beautifully. Hello BK readers! I'm Sara at House Bella. I blog about home design, DIY, and a little on my life in Sun Valley, Idaho. This project was born from a lucky thrift store find. There is a shop in my town that keeps popping out surprising mid century pieces. I mean, how lucky can I get? This one was in very rough shape. Priced at only $15, I decided to take a gamble. I began by removing the top of the dresser and all the drawers. Though constructed of solid wood the exterior of the piece is veneer, which was in various stages of color damage. The only option, short of replacing the exterior, was to paint. I happily obliged. I gave all the surfaces a medium sanding and prepped with two coats of primer. While waiting for the two coats of primer and three coats of paint to dry, I tackled the top two drawer slots. They suffered the bulk of surface damage and were not salvageable. I took the opportunity to make them shelves for my DVD player, Roku, and a charging station for all my gadgets. I decided to upholster the shelves with a beautiful modern decor fabric (click through for an upholstering how-to). Once the paint was dry, I was making good progress. I also applied two coats of polycrylic. With the top of the dresser still open, I set up my electronics and charging station. I cut holes in the back to make room for the plugs and wires. This allows the piece to sit flush with the wall instead of being bumped out by plugs. I wanted a rustic top for the dresser to offset the clean white lines of the body. I tracked down an oak slab at Lowes and had them cut the piece down to the right size. I used three coats of stain to get the deep finish I desired, then topped it with five coats of polycrylic. Because this piece sits near my front entry, I knew it would suffer the abuse of keys, bags, and anything else that was in my hands when I walked in the door. With the top in place, it was ready for action! This was an inexpensive piece to refinish. Including the cost of the dresser, my total came in under $60. I had many of the supplies on hand, with my major expense being the oak slab at $32.  Thank you Brooklyn Limestone for hosting me as part of the Trash to Treasure series! I needed to see this makeover! It was meant to be. Now I know what to do to that piece of furniture which has been mocking me with its big ugly brown-ness. Thanks - looks marvelous. Wow- I am most impressed. Creative and useful. Love the use of fabric. This is a great makeover!! I love the dark stained oak slab on top. Looks fantastic! I need to start exploring thrift stores more! That is awesome. Great idea and I will definitely be putting it to use. Love the fabric. ADORE THIS, great job - the slab on top is the best part and such a smart move. Re-using the old piece wouldn't have had the rich impact! And the fabric on the shelves is awesome - you're so darn smart. Amazing transformation, Sara!! I'm a lover of all things MCM & I adore how you updated this piece yet still respected its MCM deliciousness. =] Esp. love the pop of pattern!